Eureka Entertainment have announced a classic but often overlooked 1950s criss-crossed heist tale for combined Blu-ray and DVD release this coming 21st April. 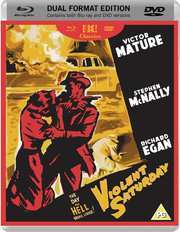 Violent Saturday is based on a novel by William L. Heath, directed by Richard Fleischer and stars Victor Mature, Lee Marvin and Ernest Borgnine. Presented in a new high-definition master, this comes with both 4.0 and 2.0 soundtracks on both discs, so don't worry late adopters you aren't being left out. Extras include a new video examination of the making of the film by Nicolas Saada, and a video appreciation by director William Friedkin. The recommended retail price will be £17.99. This tells a brutal noir tale against blazing, sun-drenched Arizona landscapes. Three criminals arrive in the small mining town of Bradenville, planning on robbing its only bank. But as they start scouting the area and gathering the information they need, the lives of others in the town threaten to get mixed up in their scheme, in a tangle that could lead to disastrous consequences. This is a fascinating gem of Hollywood storytelling, complete with memorably vicious and idiosyncratic details, brilliant performances, and stunning Cinemascope imagery.